September has arrived, and with that we will both be heading back to school on Tuesday. That’s right, both of us. After taking a look at the investments we wanted to continue to make on the farm as we grow to our goal size, and with us learning to streamline things at the farm so daily chores take less time, we decided that adding another income was the right thing to do. So as I begin my 4th year as the Agriculture Teacher at Ripon High School, Jordan will be stepping into a new role as the Tech Ed Teacher for Montello School District. No, he hasn’t taught before but he is entering the profession enthusiastically and mentors at both home and school. So how will this affect you and your ability to get great meat? Hopefully not at all. We will continue to do the Westside Community Market in Madison and the Oshkosh Saturday Market. And new on the horizon is…. Yes, that’s right, you will soon be able to have your favorite grass-fed beef, pastured pork, and grass-fed lamb shipped right to your door. We have tested shipments in very hot weather and made it work both near and far, while learning things along the way. The coming cool weather will only make it easier. Look for an announcement of this feature going live on the website. I know it has been a while since I’ve written, and in that time we hosted a field day on pig nutrition at the farm, helped out at another field day on farming conservation practices, and started construction on installing permanent watering areas and in pasture water lines. 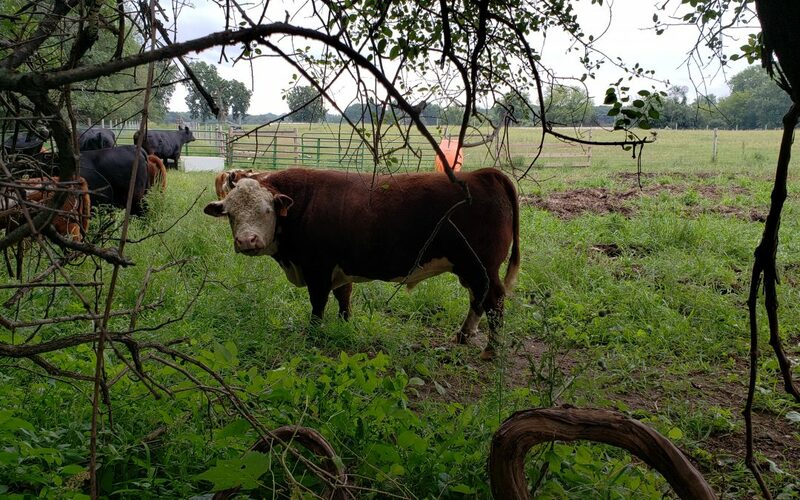 I also drove to Ohio and back last week to get us a handsome bull named George who looks like he will give us great calves. Right now I am sitting at the Westside Community Market in Madison and it is really starting to feel like Fall as it is cool and rainy. While there were tornado warnings, rotating clouds, and an immense amount of rain this week, we were spared the worst and our sandy soils with thick grass cover sucked the water right down. The lambs were brought in for sorting harvest, another sign of fall. And of course, the fact that my classroom will go from summer silence to the bustle of learning and socializing is the ultimate farewell to summer.